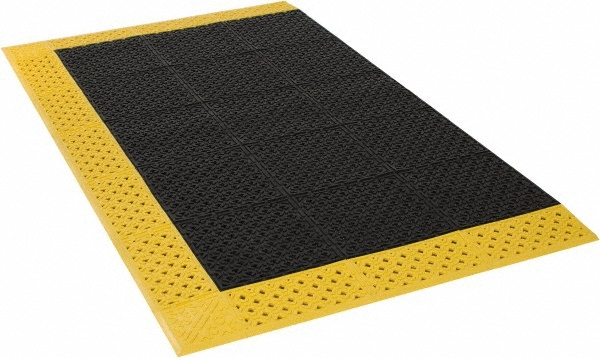 The #520 Cushion-Lok Interlocking Safety Mats by NoTrax is the ultimate industrial floor mat for use in heavy duty wet or dry applications. Oil and chemical resistant, this interlocking tile is perforated for drainage and comes with an optional #522 Grip-Step surface for extremely slippery areas! Black tiles & ramps made with 100% recycled materials. A tough PVC based workstation mat developed by NoTrax® over 30 years ago to be a truly superior industrial floor mat. Hundreds of portholes facilitate drainage while the worker is elevated on a series of traction blades to help resist slippage and keep the worker out of the spillage. Six-inch wide diamond-studded beveled ramps are permanently affixed on 3 sides and perforated for drainage. #520 Cushion-Lok™: All the durability as described but with a bottom surface design that affords maximum flex for worker comfort. #522 Cushion-Lok™ with Grip-Step®: Same as #520 but with a thick gritted layer applied to the top surface for extremely slippery environments. 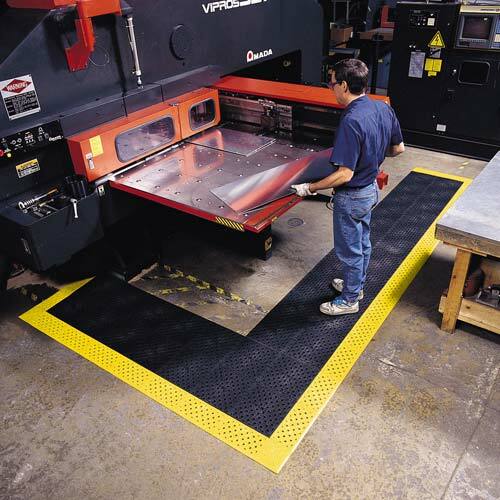 NOTE: #520HD /#522HD series of industrial floor mat are intended for extreme jobs and can withstand up to 1500 lbs. Please call 1-800-810-7847 for any custom configurations! PVC construction makes it especially resistant to chemicals found in harsh environments. Wet environments where drainage and slip resistance are a priority. Where custom configurations are a consideration.